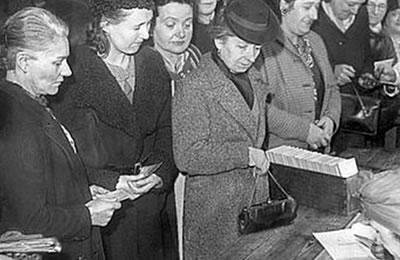 For the first time 70 years ago, women received voting rights in France. Finland was also the first European country that gave this right to women in 1906. – On April 25, 1945, a century after men gained the right to vote, 12 millions French women went to vote for the first time. Women from different social classes such as nuns, mothers, Madame Curie, her daughter and Charles de Gaulle’s wife, participated in the elections and used their rights to vote. – This right to vote was a victory and a step towards equality. – France at that time was very supportive of the right of women to vote compared to other allied countries. In New Zealand, women gained their right to vote in 1893. In Australia women voted in 1902. In America, women voted in 1920 and in England women gained the right to vote after 8 years in 1928. – Interestingly, between 1920 and 1930, a resolution in support of women’s suffrage rights was passed in the French senate, but was rejected 6 times. In 1945 only 5 percent of women had governmental positions. This census didn’t change until the year 2000, yet after this, the path for women’s partnership grew rapidly.